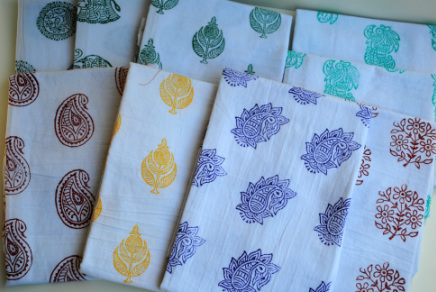 I am inspired by Indian block printed fabrics I have been collecting new and antique wood block stamps (made in India) for a few years. In 2012 I discovered a method of stamping fabric using a mixture of acrylic paint and fabric medium. I roll paint onto my blocks using sponge rollers. I am mostly printing on cotton flour sack towels. I have sold quite a few and gifted many to friends and family. Everyone seems to love them. Block printing has been a great creative outlet for me when I need a break from sewing.